If you are running a vegan/animal rights stall in the high street, free vegan food tasters are a good way to get people over. Sometimes people don’t want to look at leaflets initially because it is overwhelming, they just want to know what they can do and food tasters are a good way to introduce people to vegan food and going vegan. There is a huge amount of interest in veganism now, and most people know a bit about it, so it is a perfect opportunity to show people what is available. There is a lot of information here, but it doesn’t need to be complicated, you could even just get a few bars of vegan chocolate and cut them up, or get some vegan meat that can be served cold and chop it up into tasters. 1. Where are you going to set up your table? These mostly attract large crowds, non-vegan. You might need to get permission or a book a pitch. Often with street stalls you can just set up without asking permission. For street stalls, thinking about setting up near shelter if there is a chance of rain is important. Golf umbrellas are handy for sun/rain. People often say that chocolate and cheese are the hardest things to give up so they are good foods to include on your table, as well as vegan meat and milk. It’s good to focus on two or three different tasters. You want tasters that are available in the area where you are doing the stall. If it’s your local area you’ll probably know what is available and your favourites so start with them. We have put a few suggestions below, but things are changing so fast at the moment that it’s a good idea to keep an eye out for new foods that are available. Just one tip about vegan cheese, don’t give it out ‘neat’. For people who haven’t tried it before it works much better if you put it in things: sandwiches or pizza or cheesy garlic bread, for example. Bute Island Foods do a good range of soft and hard vegan cheese. They make Tesco and Sainsburys’ own brand vegan cheese so it’s easy to get hold of and it’s available in pretty much every health food shop and vegan grocery store. 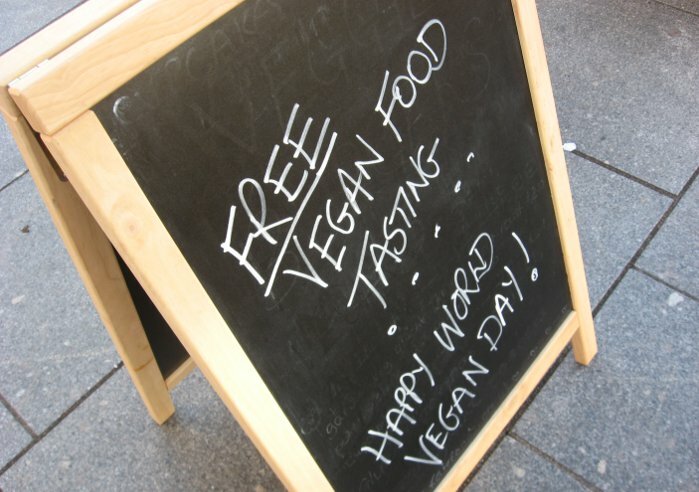 Bute Island are also very supportive of vegan tasting events so will probably be happy to provide you with some free samples to give out. As well at vegan milk or plain chocolate, a flask of hot chocolate also works well. Oatly Barista tastes really good in hot drinks, it is a game changer. Alpro ‘blue’ is a sweetened soya milk which is also popular. Find an easy cake recipe, and make and take cake tasters. For anything homemade make sure you take recipe sheets so that people can make it at home. Bristol campaigners have found that carrot cake is the most popular cake by far (their recipe at the end of this post). The vegan meats available seems to change every week at the moment so keep an eye out for new ones. Whatever you are serving, do some taste testing first. Ideally with a few people, including a couple of non-vegans. Try a selection of milks/meats/cheese/chocolate and pick out your favourites in terms of taste. Also consider price and availability of the product. If you can only get it from a shop that is out of town and it is pricey, then there is not much point offering it as a taster because most people won’t bother, they want something convenient and not too expensive. Think about how much hot food you will serve, if any. Cold food is much easier and works fine for some tastings, such as milk and chocolate. With vegan meat and cheese, including some hot food will give you a bigger variety of vegan foods to select from and serve BUT don’t let that put you off as you can offer some good choices without doing hot if you don’t want to do it. If you are expecting a lot of people to turn up (or you aren’t sure) and it’s your first taster table you might want to stick with cold food and see how that goes. If you want hot food think about what cooking and washing facilities you’ll need and try and find a space with access to a kitchen. If you are using the kitchen at a venue, check in advance that everything you want to use works ok – sounds obvious but it can avoid a lot of stress. Faith in Nature, Green People and Lush sometimes provide free toiletry samples to give out. You have got peoples’ interest. Make sure you offer them some information to take away while they are feeling inspired and more likely to take action. Offer a leaflet to every single person who comes up to the stall. Practical information on going and staying vegan. Veganuary do an all year round pledge and their website is amazing so try and give a link to their information or get some leaflets from them. Animal Equality and Animal Aid have leaflets and booklets and so do a lot of other groups so look around to find your favourite one. Recipe sheets – always popular. If you make any tasters (e.g. cake goes down really well), put them onto a recipe sheet for the stall. Bring a sign-up sheet in case you run out of recipes so that you can email them to people. Why vegan – it isn’t always made clear in the media why people are going vegan and the number one reason is for the animals so have some information about this. Go Vegan World and Animal Aid have leaflets. Often companies are willing to donate food to use on your food table. In return for giving you free food, you are helping to promote their product. Contact them a month or two in advance of your event. Local healthfood/vegan junkfood shops are worth asking for donations, especially if the stall is going to be near them. Which companies are you going to ask? A good place to start is by thinking of vegan products that you like and use a lot. Make a list of any products that would be suitable for your food tasting and find the company’s website and contact details. Don’t accept products for the sake of having extra tasters, make sure it is food you really like and that other people will love to. There are hundreds of companies that use the vegan trademark, so they are well aware of veganism and many of the companies are vegan or vegetarian. You can search using various criteria, depending on what type of donations you’re after. You might decide to focus on vegan companies first, to promote them, and then widen out from there. Give them some info about the event you are doing including details of the food tasting, location and date of the event. Give a bit of information about your group and if possible provide a link. If you’re doing it on your own, you could say a bit about yourself and why you want to do the food tasting. Explain why you think their product would fit in and why you want to promote it. Let them know where you are going to list food donors (so they get some publicity). It could be on any of the following: website event page; publicity leaflet for the event; recipe/info booklet provided for the event; Instagram; Facebook or Twitter. And of course you’ll have their information on the taster table when people are trying their food. If you can, send any companies that donate a thank you and a photo afterwards. VegFund also provide funding towards the cost of free vegan tasting events, you’ll need to apply at least four weeks in advance. Food handlers should hold a level 2 food hygiene certificate: it is useful to have and fairly straight forward to get. You can study for and get the certificate online for £15-25. It takes about 2 hours to do. You might also find that your local council runs courses. For full guidance on how to comply with food hygiene regulations in the UK, go to the Food Standards Agency website where they provide a food safety management pack for download. A basic risk analysis or HACCP can also be completed and is straightforward to do. There is an example risk analysis by Veggies here (scroll down on the page), plus other info on handling vegan food. Veggies also have some useful food hygiene guidelines. If you are unsure, stick to commercially prepared foods sold at room temperature, and give them out in their original packaging. More food sampling ideas from VegFund. This is for one 8 inch cake cut in the middle as a sandwich cake. It is based on the ‘Another Dinner is Possible’ basic sponge cake – highly recommended book by Isy and Mike of Two Trees Catering. 1) Sift flour. Add sugar. 2) Grate carrots and chuck in with the flour and sugar. 3) Add sultanas, walnuts, cinnamon, nutmeg, ginger, sea salt and mix well. 4) Add oil and vanilla essence. Mix. 5) In a separate bowl or jug mix soya milk, bicarb soda and vinegar and then add to the rest of the cake mix and mix well. 6) Put into greased tin and cook at gas 5/190’c for 40 mins. Sometimes it takes a little longer. To make the butter cream, mix 170g icing sugar with 140g margarine and 1 tsp vanilla essence. Use this for the middle and the top, then garnish the top with crushed walnuts.